The most important benefit you’ll be getting if you decide to opt for the TenPoint Crossbows HCA-097-II crossbow scope is its optics quality. The lenses are fully multi-coated, which means that this alternative is a winner in terms of light transmission, and that’s always something to consider when you’re hunting in darker conditions such as at dawn or dusk. We’ll further detail the optical components quality in the sections below. We were unable to find any negative scope reviews with regard to this particular model, but there have been some mentions about the rings. Apparently, the ones that come shipped with the model when you buy it seem to be rather cheaply made, which obviously bothers many hunters. Nobody likes carrying heavy hunting gear around, especially because you already have the weight of your weapon of choice to handle. There’s no point in increasing its overall weight to make you unstable while holding it by adding a hefty scope to it. Fortunately, that is something the TenPoint Crossbows HCA-097-II is particularly good at preventing, and that’s all thanks to its compact design. It measures just 8.5 inches, and the 32mm tube is reasonably lightweight, especially based on what the people that have used it in the past have had to say about it. 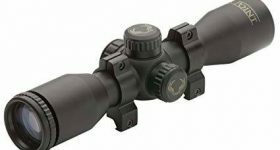 One thing that you definitely do not have to worry about is the quality of the optical components that this particular crossbow scope comes fitted with. They are fully multi-coated, which means that they are more than capable of transmitting light as they should, even when you are hunting your prey in somewhat darker conditions than the usual ones. In case you didn’t know, fully multi-coated lenses are the best when it comes to ensuring brightness transmission, so obviously, this choice comes with top-notch optics that can take your hunting to a new level by providing you with accuracy. Most of the information that we have stumbled upon notes that this device is considerably easier to mount compared to others we’ve found. It’s also worth adding that the rings are included with your purchase, so what you see is what you actually get, in this case. Sighting in the scope can be done almost effortlessly, based on what many hunters had to say about it. Its user-friendly design makes it possible for this crossbow scope to be used by almost anyone, as long as that person is aware of the velocity of their weapon. This device is equipped with a simple focus ring on the back, and that makes it possible for you to see the cross hairs and dots clearly. If you wear glasses, you will undoubtedly find this feature particularly helpful. You can also perform a simple adjustment on the side of the scope and get the dots illuminated with red or green light. Some buyers recommend avoiding using the highest setting right off the bat, though, so it might be a good idea to start with the minimum one and only then performing other adjustments as the daylight gets stronger. This product comes with a 3x fixed magnification. On the one hand, that might seem like a disadvantage because you have no means of adjusting it depending on your momentary necessities, which means that you’ll partly have to ‘zoom in’ and ‘zoom out’ using your own two feet. 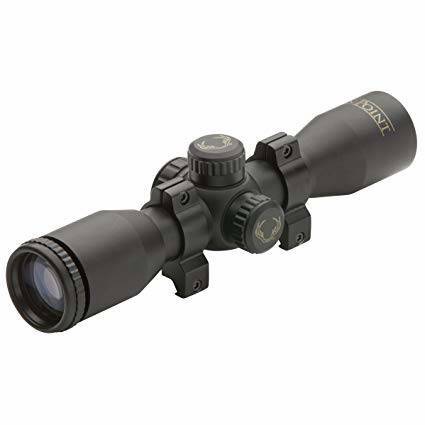 However, this type of magnification is the one commonly featured by most spotting scopes and since you won’t be fiddling with any parts, you will also expand the life of the product and be able to enjoy it for as many future hunting seasons as possible. Some hunters even note that it is higher than what they usually prefer. There are many reasons to consider this particular crossbow scope. It’s easy to install, it provides you with the accuracy you need to get a clean kill, and the optics are fully multi-coated and offer you excellent light transmission. The images are clear and bright, so you have a perfect sight to get your next target and strike it down. Mounting and adjusting the scope can be done effortlessly, and the compact design definitely helps since you won’t find it too hard to carry or use on your bow.